Uber plans to take its fight over the employment status of its UK drivers to the Supreme Court. Earlier this month the Employment Appeal Tribunal rejected the ride-hailing firm's argument about the status of employees. Unions argue that staff should be classified as "workers" rather than being self-employed. Such a move would entitle them to rights such as holiday pay and sick leave. Uber could have first taken the case to the Court of Appeal. 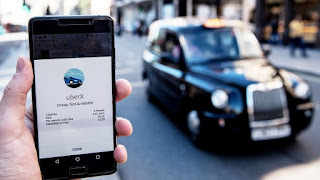 An Uber spokesman said it had requested permission to appeal directly to the Supreme Court so that the case "can be resolved sooner rather than later". Drivers James Farrar and Yaseen Aslam took a case to an employment tribunal last year, arguing they were Uber staff and entitled to holiday pay, paid rest breaks and the minimum wage. After the Employment Appeal Tribunal upheld the original tribunal ruling, Uber UK's acting general manager Tom Elvidge said: "Almost all taxi and private hire drivers have been self-employed for decades, long before our app existed. "The tribunal relies on the assertion that drivers are required to take 80% of trips sent to them when logged into the app. As drivers who use Uber know, this has never been the case in the UK." Mr Elvidge said Uber had made changes to its app to give drivers more control, as well as offering illness and injury cover. Uber is also appealing against the decision by Transport for London not to renew its a licence to operate in the capital. The body ruled in September that Uber was not fit and proper to obtain a new private hire licence.